Antipasto in Italian means “before the meal.’’ It’s meant to whet your appetite and tide you over until the main course arrives. But the line between a tasty nibble and overindulging is easy to cross when the appetizer consists of sliced cured meats, cheeses, olives, marinated vegetables, and other delicacies. Add a glass of wine and the assortment of rich, salty, spicy foods becomes a leisurely meal. And there’s no cooking involved. Your job is to shop well. 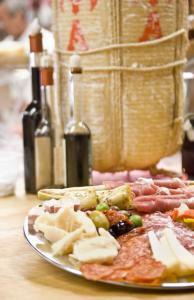 A meal of antipasto must include lots of different cured meats. “The meat is the star,’’ says Gaetano (Guy) Martignetti, owner of Salumeria Italiana in the North End. Salumi, the catchall term for Italian cured meats, are generally made from pork and include two styles. One is the large, whole muscle cuts and the other is salame or salami, which include various ground-meat mixtures in casings, cured and dry-aged. For the large cuts of meat, there’s a choice of prosciutto (cured ham), culatello (the center cut of the ham), and coppa or capocollo (pork shoulder). Salami may be finely or coarsely ground, and spicy hot or mildly flavored with seasonings such as chili peppers and fennel. The best salami - including classic felino, finocchiona (flavored with fennel), and soppressata - are well marbled with smooth fat, and have a dense-chewy texture, red color, and a tangy, meaty flavor. Because of import restrictions, about half of the salumi that Martignetti carries in his store is produced in the United States. Martignetti, whose father, Erminio, started the business in 1962, carries cured meats from two San Francisco producers and one based in St. Louis. The key to serving cured meats, says Batali, is to “slice them very thin, so you can taste the delicacy of the product.’’ At Salumi, he says, workers cut 80 slices to the pound. Cheese is next in the lineup. Cubes, chunks, or slices of hard or semisoft cheeses are perfect for picking up with your fingers and wrapping inside a slice of salami or tucking into a piece of bread. Martignetti recommends aged provolone (preferably the imported Auricchio, which he buys as a whopping 6-foot-long, 240-pound cylinder); pecorino, which is a sheep’s milk cheese; and, always, nuggets of nutty Parmigiano-Reggiano. Other good nibbles include olives, marinated artichokes, and roasted red peppers. “And always pickled vegetables,’’ says Martignetti. The vinegary mixture called giardiniera, which includes carrots, peppers, cauliflower, and onions, brings a desirable acidic contrast to the rich meats and cheese. Unlike French charcuterie, which is always served with grainy mustard, an antipasto plate rarely includes condiments. “They might be regional, but they’re not typical,’’ says Martignetti. In fact, whatever is served as antipasto in Italy varies regionally and seasonally, explains Michele Topor, an Italian cuisine aficionado who gives culinary tours of the North End. “Along the seacoast, you’ll find more seafood,’’ she says, such as anchovies on the Amalfi Coast, and tuna and octopus in Sicily. Cow’s milk cheeses are more prevalent in the north, where grazing land for cows is more plentiful, and sheep’s milk cheeses dominate the south. Once you know how you’re assembling your platter, the final decision is how much to buy. “You have to assess the guests,’’ says Martignetti. Quantities will depend on their appetites and whether this is a first course or your impromptu meal.